What is Cyclosporine (Modified) Generic To Atopica? Cyclosporine (Modified) capsules, a generic to Atopica, are used for the treatment of atopic dermatitis in dogs, which is a non-contagious skin disease characterized by chronic inflammation of the skin. While its not approved by the FDA for cats, it is commonly prescribed by veterinarians to treat cats. Cyclosporine requires a prescription from your veterinarian. Cyclosporine targets cells in the immune system that cause the allergic reaction in your pet. 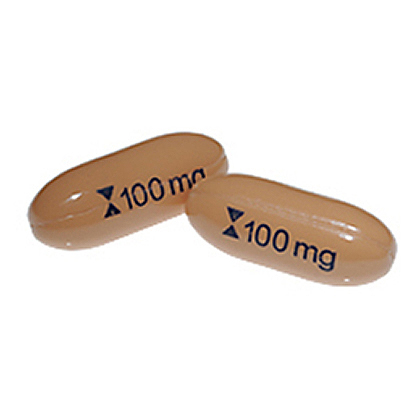 Dosage varies, and can taper off to fewer doses after several weeks. Consult with your veterinarian for specific treatment details. Consult your veterinarian about possible side effects or drug interactions. Give cyclosporine modified exactly as directed by your veterinarian. If you do not understand these directions, ask your veterinarian or pharmacist to explain them to you. Always give cyclosporine modified 2 hours before or 2 hours after a meal. Allow plenty of water for the pet to drink. Do not remove a capsule from the blister pack until required for use. When the capsule is removed from the blister pack there is a characteristic, noticeable smell which is normal. Your veterinarian may want your pet to have regularly scheduled blood tests during treatment to monitor effectiveness and side effects. Store cyclosporine modified at room temperature away from moisture and heat. The safe use in breeding, pregnant or lactating dogs has not been determined. Do not use cyclosporine modified in dogs with known allergy to the medication. The drug should not be used in dogs with kidney disease, stomach ulcers, and certain blood disorders. 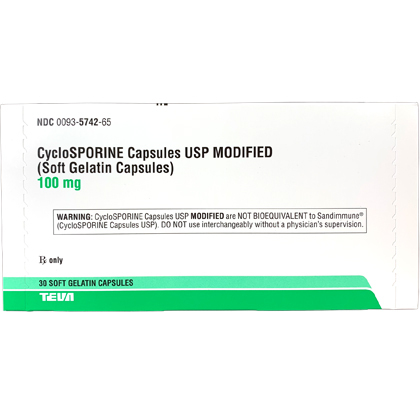 Prolonged use of cyclosporine modified can result in bacterial or fungal infection related to a decreased effect of the immune system. If any of the following serious side effects occur, stop giving cyclosporine modified and seek emergency veterinary medical attention; an allergic reaction (difficulty breathing, swelling of the lips, tongue or face, and hives). Other less serious side effects may occur. Continue giving cyclosporine modified and talk to your veterinarian if your pet develops vomiting, soft stools or diarrhea, muscle cramps, muscle weakness, loss of appetite, and change of hair coat. Other side effects may occur. Talk to your veterinarian about any side effect that seems unusual or bothersome to the animal. Do not remove capsule from blister pack until required for use. When the capsule is removed from the blister pack there is a characteristic, noticeable smell which is normal. Store this product at room temperature. Some variation in the color of the powder may occur from batch to batch. Other Ingredients:Dehydrated Alcohol 18.6%, dl-alpha-tocopherol, FD&C blue #2 aluminum lake, ferric oxide (yellow), gelatin, glycine, glycerol 85%, polyoxyl 40 hydrogenated castor oil, polyglycerol (3) oleate, polyglycerol (10) oleate, sorbitol solution, titanium dioxide.